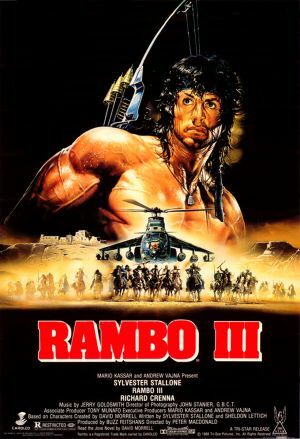 Will Rambo III stick to the same pattern of explosions and foes underestimating Rambo? Rambo III centres around John Rambo’s quest to save his ex-senior officer, Colonel Trautman, from the grasps of the Russian dictator, Colonel Zaysen. To do this, he must cross the border from Pakistan to Afghanistan and infiltrate a Russian stronghold, killing all that stand in his way. In contrast to the first two of the franchise, the plot of this film isn’t made up from villains underestimating Rambo and his battle for vengeance, but from his loyalty to Trautman and drive to save him. This change in direction creates a completely different experience and story, with Rambo now actively becoming a traditional hero, attempting to save anyone captured at the fort. Rambo is once again acquainted with an ally, this time in the shape of Mousa Ghani, played by Sasson Gabai. In Ghani’s attempts to dissuade Rambo from his assignment, Rambo once again shows his commitment and loyalty to those that don’t betray him – a trait that we’ve come to love as the franchise progresses. Rambo’s new found friend adds depth and draws important conversation from our protagonist – offering the prospect of more character depth than First Blood: Part II. However, it unfortunately doesn’t go much further than this with Rambo soon back to the killing. The third film is often known as the difficult or least successful of a franchise, something that Rambo III certainly isn’t. Rambo III is packed with more explosions and kills, aligning itself with the second in the franchise, more than the first. However, the new path the story takes allows Rambo III to steer away from it’s predecessors, creating a more appealing film to fans of the action genre.